One joy of visiting Brooklyn is experiencing the Italian food and culture. Hankering for cannoli? Want to hear Sinatra while munching pizza? Some say the "old Brooklyn" of almost exclusively ethnic neighborhoods is rapidly becoming a matter of history. But Brooklyn's Italian neighborhood strongholds, while diluted, have maintained a visible (and edible) Italian presence. Brooklyn's Italian Neighborhoods include Bensonhurst, Brooklyn's most "Italian" neighborhood; Dyker Heights, a residential community adjacent to Bensonhurst, famous for it's lavish Christmas lights displays; Williamsburg, home to Brooklyn's July San Genario festival; and Carroll Gardens and Red Hook, once the home of Italian longshoremen. You'll still find aspects of the Italian way of life in these neighborhoods including churches, Italian groceries, and foods. It's fun to visit a Brooklyn Italian neighborhood with an eye on what makes it feel, well, Italian. Start with shopping and eating. On the retail level, even Carroll Gardens, once a very tightly-knit Brooklyn Italian neighborhood that's been gentrified almost beyond recognition, still supports a number of traditional Italian stores founded in the 20th century. Visitors to Bensonhurst or Dyker Heights can get the sense of the neighborhood in many ways, from the presence of private men's or social clubs, to popular celebrations of Roman Catholic religious festivals, Italian-style. Weekend visitors may be treated to the occasional glimpse of a traditional wedding taking place in a local Roman Catholic church, or limos lined up in front of Italian-oriented wedding halls. 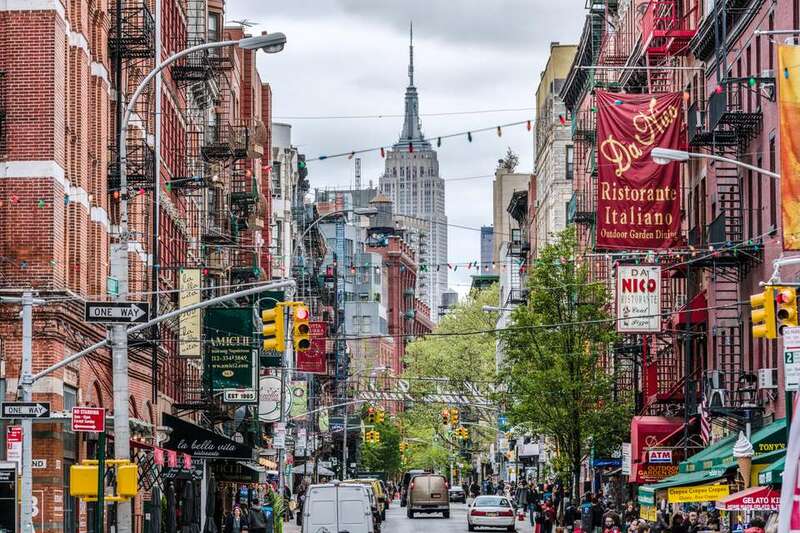 Shopping and food aside, Brooklyn's Italian neighborhoods are socially cohesive in ways that may not be visible to the casual tourist. In old Brooklyn Italian neighborhoods, there are informal support networks that work in many ways, including assistance to newly arrived Italian immigrants by established Italian-Americans. Brooklyn's Italian communities also support various Catholic private schools. Community ties within the Brooklyn Italian-American community, while not necessarily visible to outsiders, can run strong. Are Mafia families still in Brooklyn? Yes, apparently so. An FBI family tree of five Mafia families, or Cosa Nostra, including some individuals based in Brooklyn, suggests that the Italian mob still operates from New York City. In Italian Williamsburg, the community celebrates its Italian roots during the annual Giglio Feast held every July since 1903. The event originally commemorated a special event in southern Italy in the little town of Nola involving celebrating with lilies (Gigli). Ultimately, the church combined the Giglio Feast with the feast honoring Our Lady of Mount Carmel. Another huge festival that is fun to visit is the annual Feast of San Gennaro, the patron saint of Naples, held on the streets of historic Little Italy, in lower Manhattan each September. The event not only attracts the area's Italian-Americans, but it is also a fun destination for almost a million people who enjoy the food, live music, and festivities.